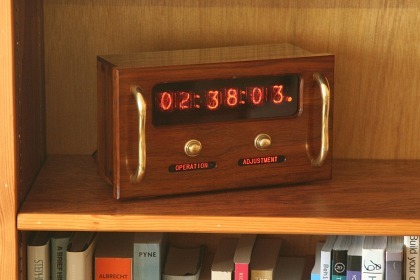 This is a Nixie tube clock based on the 6-digit IN-12 kit from www.kosbo.com. 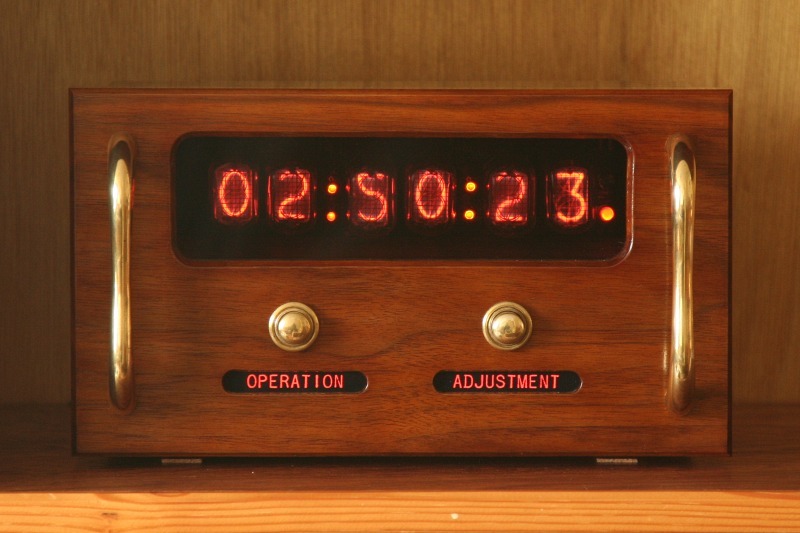 Nixie tubes are a form of neon cold-cathode numerical display, and were widely used in scientific and industrial equipment before the introduction of 7-segment LED displays. 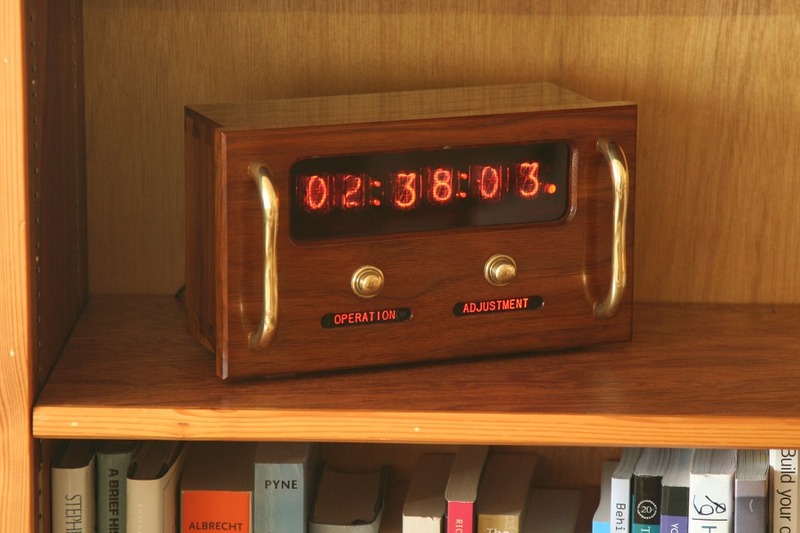 Their warm, orange glow is easier on the eye than modern LEDs so they make great clocks. Kosbo supply clocks either as a kit or as a fully assembled circuit board, ready for you to fit in your own case. For my case I came up with a sort of "steam-punk rack-mount" design. It's made from American black walnut and finished in amber shellac (Colron French polish). The case construction is a simple 4-sided box with half-blind dovetails at the corners. The face panel is overlaid on the box and attached with pocket screws from inside. The brass handles are drawer handles from B&Q; originally a rather dull "antique bronze" finish, I polished them up to a shiny but still worn-looking finish. The buttons for switching modes and adjusting the time are brass door bell pushes that I picked up for a couple of pounds each on eBay. They were old stock and had a slightly tarnished finish that fits well with the overall aesthetic. The back-lit captions below the buttons were made using a laser printer to print onto transparency sheet. The back-lighting is provided by 607nm orange LEDs, which are a good match for the colour of the IN-12 Nixie tubes. I used a piece of translucent plastic cut from a milk jug behind each transparency to act as a diffuser. 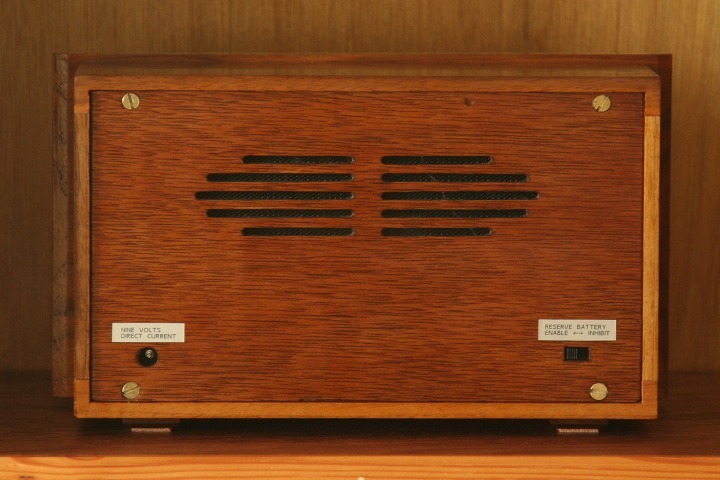 The back panel was cut from a scrap of ¼" plywood, and stained to approximately match to the colour of the walnut. I cut some slots for ventilation and to let the alarm sound out. If you look closely you may notice that the vents have mesh inside (to keep spiders out!) - the mesh came from a frying pan splatter guard bought from a pound shop. I don't like to spend more than I have to!